Fibrils of the protein alpha-synuclein, that plays a role in Parkinson's disease, form a stiffer and stronger network in water, when temperature is increased. Researchers of the University of Twente show that this has to do with the water-repellent part of the fibres coming to the surface and interacting. The mechanism could also play a role in the interaction with healthy cells. Researchers of the University of Twente publish about it in Physical Review Letters of May 17. Alpha-synuclein is abundant in our brain. It is known that it can turn against us: in neurodegenerative diseases like Parkinson, the protein shows aberrant behavior: after forming fibrils, the protein can form plaques. It is still not known how this mechanism works. The research now presented by the UT scientists, shows that the properties of alpha-synuclein are 'tunable." In the lab, in water, they will form a stiffer and stronger network when temperature is increased. Lowering temperature again, the network gets less stiff again. Although all this takes place in a temperature range that will never take place in the brain, the underlying mechanism could give more insights in the role that the proteins play in the onset of disease. The tunable stiffness is induced by 'hydrophobic interaction': the water-repellent part of the fibres is the clue. The research that is now presented in Physical Review Letters, shows that the strengthening of the network is caused by an increase of the number of contact points of the fibrils. These contact points all are in the hydrophobic parts of alpha-synuclein. The reason why this is remarkable, is that the hydrophobic part normally is 'shielded' by the other two building blocks of the protein: a part with an electric charge and a part that is amphiphilic (it likes both water and lipids). Taking away this shield and opening up the hydrophobic part, may also play a role in the disease: this part is capable of damaging healthy cells. Even human's own natural defense mechanisms can work against us, in this case. Previous research showed that 'cleaning up' of the hostile proteins is typically done by 'clipping' the part that is electrically charged, thus taking away the shield of the hydrophobic part. The fibrils can now find contact points, form networks and attack cell membranes. In this way, the natural protection is taken away. The research helps understanding the mechanisms, but it can also inspire e.g. nanotechnologists for creating new types of artificial structures that can be tuned. 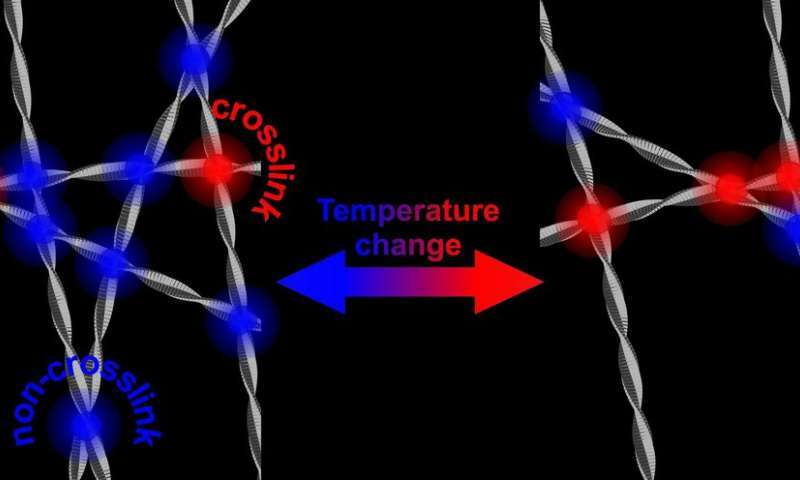 At first sight, stiffening of the network is known from polymers, but hydrophobic interaction is an entirely different mechanism that could be used in artificial structures as well.